This clever dessert fills a spicy gingersnap pie crust with an apple pie-inspired ice cream. Make the crust: Heat oven to 350°. Combine gingersnap crumbs, flour, sugar, butter, and salt in a bowl and stir until evenly combined. Press into the bottom and side of a 9" deep-dish pie plate, and bake until lightly browned at the edges, about 10 minutes. Let cool completely. Make the apples: Heat butter in a 12" skillet over medium-high heat. Add cinnamon, salt, and apples, and cook, stirring occasionally, until apples are softened slightly, about 8 minutes. Add 1/4 cup sugar and syrup, and cook until glazed with syrup and tender, about 4 minutes more. Remove from heat and let cool completely. Prepare Vanilla Ice Cream according to instructions. Once churned, stir apples into ice cream, and then transfer ice cream to pie crust, smoothing the top with a rubber spatula. Sprinkle with more gingersnap crumbs, and freeze until set, at least 4 hours. Meanwhile, make the caramel sauce: Heat 1 1/2 cups sugar in a 2-qt. saucepan over medium-high heat, and cook, swirling pan, until it turns into liquid caramel. Remove from heat and add cream and alcohol; once bubbling subsides, return pan to heat, and stir until smooth. Remove from heat, and let cool to room temperature. 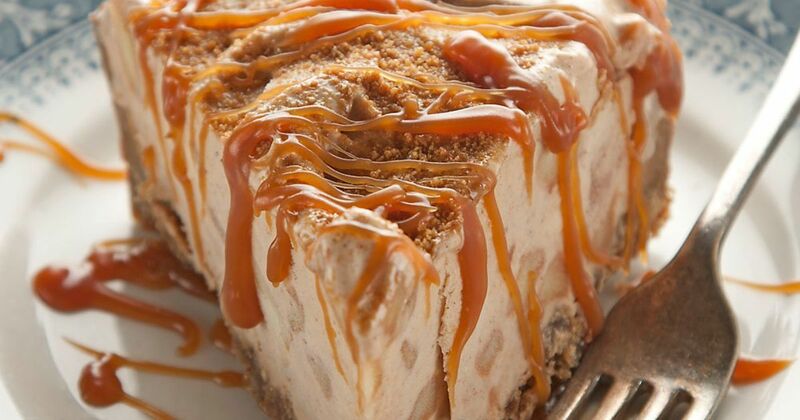 Serve pie with caramel sauce drizzled over each slice.